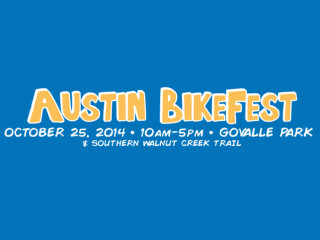 Celebrate the opening of the Southern Walnut Creek Trail, Austin’s newest multi-use path, with all things bike-related. The ribbon-cutting for the trail will occur at 8:30 am with U.S. representative Lloyd Doggett and Mayor Lee Leffingwell. Following that, the festival starts at 10 am with an all-ages bike ride. Or you can stay put for all the activities centered around Govalle Park, including a kid's bike race, costume contest, live music, BMX ramp, a raffle and more.